"WR6_gUnUj-ztiW07KQcOCnTel9A"/> Notes From Atlanta: What a Terrible Way to End the Year! What a Terrible Way to End the Year! With every passing day, my faith in Nigeria dissipates. The wicked and meaningless bombing of Christians while they were celebrating Christmas in their churches dramatize the hopelessness that Nigeria is mired in. Why would any sane person brutally murder innocent, defenseless men, women, and children who merely chose to practice a different faith and who did no one any harm? I wept profusely when I saw pictures of dead children torn to shreds by bombs at a Catholic church in Madalla near Abuja. What kind of bitterness can animate that magnitude of savage bloodthirstiness? What happened to our humanity, our sense of compassion, our spirit of neighborliness? While ordinary folks, who are more alike than unlike, are killing each other senselessly, the cabal of predatory usurpers who rule us will soon visit unexampled misery on working- and middle-class Nigerians through the impending IMF/World Bank-inspired fuel price increase fraudulently disguised as “fuel subsidy removal.” What are Nigerians doing to confront this? In the past few days, my November 5, 2011 article titled, “Biggest Scandal in Fuel Subsidy Removal Fraud” where I called attention to Jonathan administration’s signing of a multi-billion-dollar contract with Trafigura to ship toxic, low-grade fuel to Nigeria has generated unprecedented traffic. It has received nearly 30,000 hits in a matter of days—and counting. None of my articles has ever received that much attention. I got word from people in Nigeria that the article was repeatedly mentioned at the Nigerian Senate's public hearing on the removal of fuel subsidy and in many radio programs and informal discussions across the country. That probably explains the explosion of interest in it. 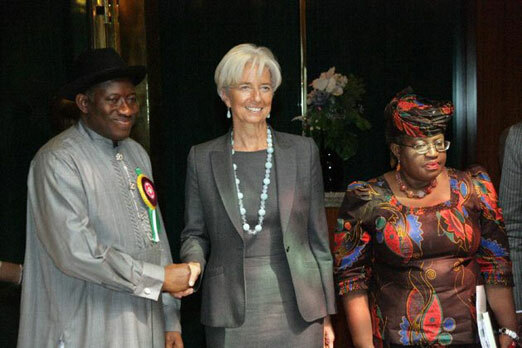 The truth is that the Goodluck Jonathan administration, goaded by the IMF/World Bank which recently paid a “thank you” visit to their minions and foot soldiers in Nigeria, has declared war on Nigerians. They are not only going to increase fuel prices beyond the reach of ordinary Nigerians, they are also investing trillions of naira to import toxic fuel that will wipe off Nigerians from the surface of the earth. Instead of uniting to extirpate this monster of depravity that masquerades as government, savage, bloodthirsty atavists are busy murdering innocents who are just as screwed by this IMF/World Bank controlled government as anybody else. I am taking the liberty to reproduce below a few of the encouraging comments that readers have left on my website and on my Facebook page. But I am deeply saddened that the indignation and unity revealed in the messages I receive daily from all over Nigeria are undermined by the senseless acts of annihilation we have seen in the last few days. Until we learn to live with our trivial, incidental differences (such as our religious and ethnic differences), we will all be screwed. This nation is being undermined on all front, i am just wondering what divine string has kept us together this far. But sure ignorance is a factor, how i wish i could translate this into forty Nigerian languages and mass produce it for continuous public sensitization for 4 months let’s see if a REVOLUTION will not sound! I will never forget the word 'Trafigura.' What a nice piece, Prof! Keep it up. Dr. Farooq, thanks for this enlightening eye-opener piece. Since we have leaders who dumped themselves on us and who are themselves poisoned petrol, it becomes easy for foreign firms to dump poisoned petrol on us. And now at a higher unsubsidized price--if we allow them and their local corporate (sorry, political) collaborators. This piece is soul-touching, a clear signal of what is to come from the Mighty PDP, Nigerians 2 decide positively or otherwise; God help us. Great to have this revealed. Next thing is 'what do we do'? We are a people not familiar with violence such as experienced among some Arab nations. Something needs to be done. It’s unfortunate that our media do not carry out investigative journalism and bring this out to the public. They've all been bought. Thank you for bringing this devilish act to the open. I hope Nigerians will stand up and fight for their rights. To the NIGERIAN GOVERNMENT: What goes around comes around. Thanks to Kperogi for this highly edifying piece! If the facts exposed here are accessible to my fellow countrymen, the much clamoured "Nigerian spring", or better still, Nigerian "winter", if you like, is inevitable. It is only a fool that will not appreciate this well-researched article by Prof. Farooq Kperogi. You know what? Maybe the Arabs were impatient for starting the 'Arab Awakening' because it should have started in Nigeria, where the government doesn't even care about, much less listen to, the masses which it represents. Prof Farooq, YOU ARE THE TYPE PERSON NIGERIA NEEDS. Dr. Farooq, I’ve read your piece and found it quite revealing. I AM SORRY FOR ANY COUNTRY WHICH DOES NOT HAVE INTELLECTUALS LIKE YOU; I AM EVEN MORE SORRY FOR A COUNTRY THAT HAS PEOPLE LIKE YOU AND REFUSES TO LISTEN TO THEM. I am glad that your article found mention in the Senate. But I will not praise them until they are able to pursue this issue to a positive conclusion, particularly now that news has filtered in that the 2012 Appropriation Bill has no oil subsidy allocation. My brother, prof, Jonathan just wants to satisfy the cabals who put him into Aso rock most of whom are importers of this deadly, toxic so-called "petrol." Investigation has revealed that Nigerian masses don’t benefit from the fuel subsides but only a few high-placed people. We shall resist if our Ghana-Must-Go lawmakers fail to act to save us from these cabals. Fuel Price Increase: Time to Occupy Nigeria!